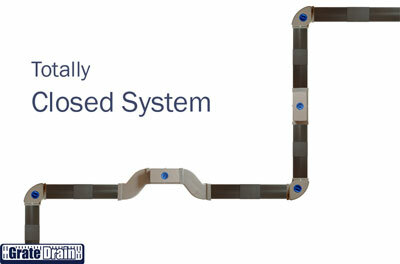 Integration of components makes the GrateDrain system so effective. 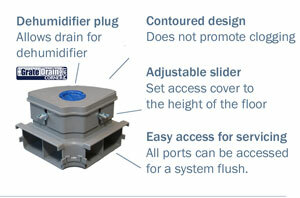 Corner Ports, S-Adaptors, GrateDrain Outlets, and GrateDrain T-Ports provide many features including; easy system flush, optional air resistant floor drain, Dehumidifier plug, available extensions, quick connection to the GrateSump. GrateDrain protects the entire basement. The GrateDrain is installed on the perimeter below the basement floor. The corners have accessible covers to allow a service technician to flush out the system if needed. GrateDrain Corner Ports are actually a 90-degree turn, which allows water to flow faster.